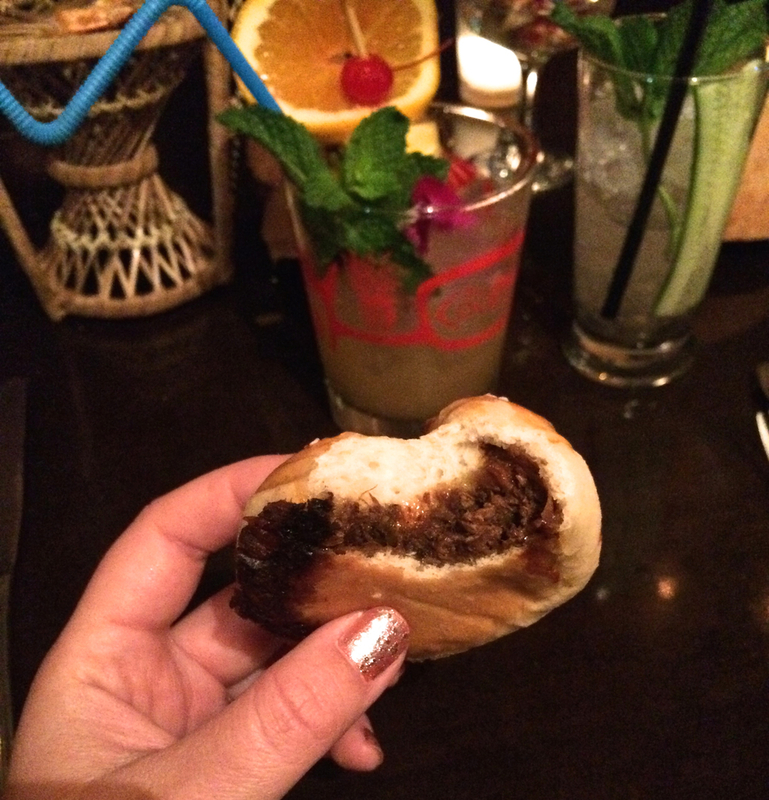 In early 2015, we were able to experience an amazing evening at the Coconut Club (LA's "underground" tiki supper club that pops up from time to time and is almost always sold out). We absolutely loved it and suggest you read all about our peek inside the Coconut Club since it was a wonderfully extravagant evening. It was a 3-hour tropical getaway with multiple courses for dinner and stunning cocktails that accompanied our meals. The food was great, drinks were amazing, and the entertainment was, well, entertaining. Because we enjoyed our first experience so much, we were excited to see that the Coconut Club had begun offering shorter form events (at a lower price point). Each time this tiki supper club pops up, it varies slightly in menu, drinks served, logistics, etc., which is great for the repeat customer! In general, the new shorter events they've been offering are more of a seated cocktail hour with several curated tiki drinks, delicious appetizers that accompany them, and no lack of entertainment of course! We left with our thirsts quenched while feeling happily full & very appreciative of the tiki escape. Want to know all the details? Here's how we spent our night at the Coconut Club this past August! This time around, the Coconut Club popped up at Sonny's Hideaway in Highland Park. The venue was a lot smaller than the last one but it wasn't lacking in character or tiki decor! When we arrived, I was happy to see that there were menus for the night since last time I had a really hard time remembering what went into all of the delicious food and drinks we feasted upon. Our first course started out with the Coconut Club Cocktail. I was excited to see this one on the menu since it was my favorite drink during our first Coconut Club experience! The presentation this time was very different, though, since the drink was served in a newly offered signature Coconut Club glass. It was also paired with a few pupu-platter-esque bites to eat - all super tasty. My favorite was the duck bao (pictured below mid-consumption). This kind of made us wish all tiki drinks were served with a side of deliciousness. The most interesting drink of the night was served during the second course. I've never had a cocktail that included green juice so this was certainly a first for me! That paired with the smoky Mezcal, fruit juices, and Thai basil made for a very innovative drink. That's one thing that the Coconut Club has been great about all around - their level of creativity is top notch! The oyster shooter was very unique and a cool accompaniment to the cocktail and food pairing. The food served was a nicely portioned skewer with coffee-rubbed steak, a roasted potato, and a shishito pepper. We had the privilege of trying the steak at the last event and this one was also perfectly cooked! Everything went really well together. And I can't forget to mention the presentation of this wonder - wow! Maybe it's because I used to make to-scale models back in the day at architecture school, but everything about this setup from the sandpaper to the astroturf to the cocktail umbrella and the oyster shell was SO cool. Really, it was the perfect representation of "surf" and "turf"! A visit to the Coconut Club just wouldn't be complete without consuming a cocktail served in a coconut. This time around, dessert was the course for that treat. It was accompanied by fire (a necessary taste of danger for just about any tiki night) and a skewer of delicious dessert bites that brought this drink to the next level! This was a great end to the evening and the cocoa butter rum ball was to die for. Beyond the amazing food & drinks that were served, Darren was once again enthusiastically MCing the event. This time he wasn't the only entertainment, though...he got some of our fellow guests to join in on the fun with a new addition since our last visit: The Tiki, Tiki, Tiki, Tiki, Tiki Wheel! It was amusing to see what surprises, prizes, and perils were in store as the wheel got spun over the course of the night. 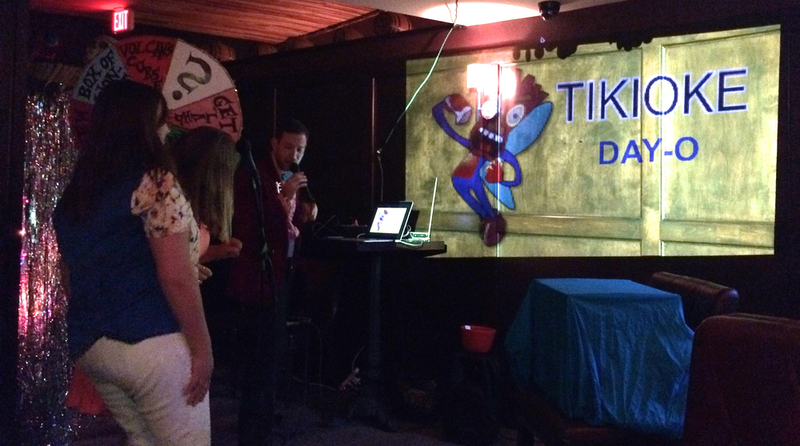 I have to be honest, though, I'm glad my name didn't get chosen for Tikioke (tiki karaoke) - sorry, that's the introvert in me! As the night came to a close, we all said our farewells and we were given a parting gift of sample bottles of Blue Chair Bay Rum. We were also able to purchase the signature Coconut Club glasses (that the Coconut Club Cocktails were served in). They may or may not be included in the cost of admission now but, either way, they're a nice souvenir and the perfect addition to any homes growing barware collection! In the end, we were once again completely blown away by the amount of creativity and talent that the guys who run this event put into it. We really need to get on these levels for our upcoming Modern Tiki Wedding! In any case, we've had fun watching the Coconut Club evolve over the course of its iterations (both in person and vicariously through social media posts). This shorter form event is a nice little tropical escape perfect for just about anyone and great for a date night or an evening out with friends. Overall, it's a great taste of all that the Coconut Club has to offer from ingenuity to culinary talent to pure fun. We can't wait to see what's in store for this year! Want to check out the Coconut Club yourself? You should! Follow them on Facebook, Instagram, and Twitter. Be sure to check out their website and sign-up for their newsletter since tickets tend to sell out super fast! Pro Tips: Buy tickets as soon as they're announced & arrive early (sometimes parking can be a little tough)! Take an Uber if three drinks will put you over the limit. OH and don't take their suggested dress code too lightly - the more you dress up for the occasion, the better! This is all about being immersed in the world of tiki for a night while having lots of fun!